Parlez-vous français? 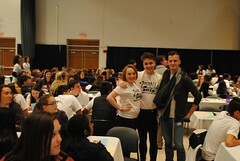 The 14th Annual French Immersion Day took place on Wednesday, November 2nd, with 296 high school students from 19 Ohio schools participating. 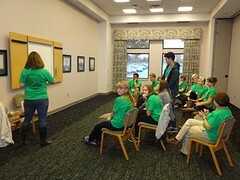 Students and their 24 teachers traveled from as far away as Mansfield, Ohio, to attend the event! 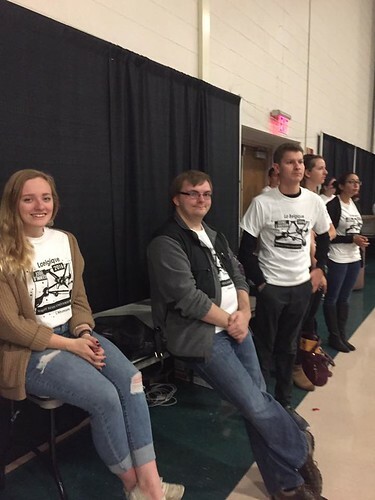 Over 75 Wright State student volunteers and students in service-learning designated courses assisted the French section in preparing and organizing the day’s events, which were centered around the theme of Belgian life and culture. Michelle Streeter-Ferrari, the Director of the University Center for International Studies - who also happens to be Belgian - was the keynote speaker, opening the ceremonies with a rousing speech on the growing importance of the French language and her personal connections to Belgium. 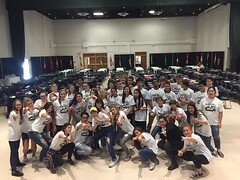 French language activities included: ice-breaking games, a flag parade, welcoming ceremonies, a Belgian-inspired lunch, and seven break-out sessions, such as a chocolate tasting, zumba, a treasure hunt, karaoke, and a trivia game based on Belgian comic books. This annual recruiting event brings top students to campus for a day of academically based engagement. The 15th annual French Immersion Day will take place on Wednesday, November 8, 2017. 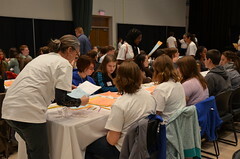 Wright State University had a spectacular day, Tuesday November 10, hosting 250 high school students and 17 teachers for our thirteenth annual French Immersion Day, a recruitment and service event that is held every November in conjunction with National French Week. 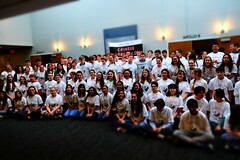 The following 14 high schools participated in the experience: Allen East High School, Anna High School, Arlington High School, Deerpark Junior/Senior High School, Dublin-Coffman High School, Dublin Jerome High School, Dublin-Scioto High School, Fairmont High School, Finneytown High School, Jonathan Adler High School, St Xavier High School, Sycamore High School, Vandalia-Butler High School and West Liberty High School. 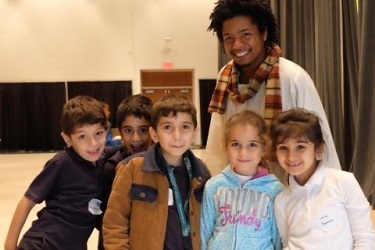 This year, the theme was “The French Antilles,” with all target language activities and sessions focusing on the history, culture, geography, and music of this beautiful Francophone area. Students enjoyed interactive and engaging activities designed to put them at ease and empower them to speak the target language. The morning began with trivia games prepared and presented by WSU French Conversation students (FR 3110), followed by a flag parade and a welcome speech in French by our Department Chair Dr. Marie Hertzler. Break out sessions included: Karine Daddah's tropical fruit presentation and tasting, Pascale Abadie's Island Trivia, Bryan King's (French Club president) Music Bingo, Sarah Koraym's (French Club Vice-President) Find-a-person-who Bingo, Kirsten Halling's zumba lesson and dance, Ben Hirt's Composition Class' “Legends and Tales from the French Antilles.” Students competed to win Eiffel Tower gummies, Mardi Gras necklaces, and other fun prizes. When jailors put very few students in “le bagne” (the penal colony) for speaking English, they earned their release by composing French poems using Magnetic Poetry. One of the highlights of the day was when the Wright State School of Music provided beautiful French music to accompany a delicious Caribbean themed lunch consisting of Jamaican Jerk Chicken, beans and rice, a tropical salad, and mango or key lime choux pastries. 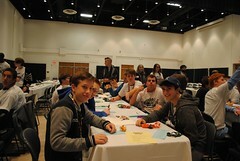 2014 French Immersion Day: "La Gaule"
The twelfth annual Wright State French Immersion Day took place again in the Student Union on Wednesday, November 5, 2014. In attendance were 192 upper level high school French students from eighteen area high schools: Sycamore, Jonathan Alder, Anna, Dublin Scioto, St Peter’s, Allen East, Miami East, Urbana, Van Wert, Colerain, Mt Vernon, Milford, William-Mason, Northwestern, West Liberty-Salem, Arlington, Carroll and Kettering-Fairmont. 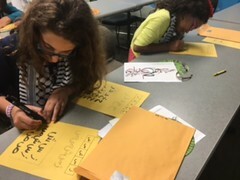 All participating students signed a pledge to speak only French during a day of French language games and activities centered around the theme of "La Gaule." The many target language activities included trivia games based on "La Gaule", a dance, Gallic legends, songs from the "Dana" tribe, charades and a food tasting with authentic Gallic food such as apples supplied by Kroger and Trader Joe's. Those students daring to speak English were jailed and were forced to write poetry in exchange for their liberation. Wright State University catering services provided a French luncheon, complete with "boeuf bourguignon," croissants and apple tarts. 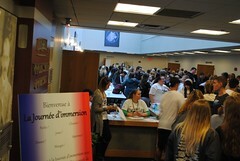 2013 French Immersion Day: Bienvenue chez "Les Misérables"! The eleventh annual Wright State French Immersion Day took place again in the Student Union on Wednesday, November 6, 2013. In attendance were 241 upper level high school French students from fourteen area high schools: Oakwood, St. Xavier, Sycamore, Jonathan Alder, Anna, Dublin Scioto, Allen East, Miami East, Chaminade-Julienne, Finneytown, Franklin City, West Liberty-Salem, Arlington, and Kettering-Fairmont. 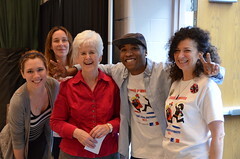 All participating students signed a pledge to speak only French during a day of French language games and activities centered around the theme of Victor Hugo's "Les Misérables." The many target language activities included trivia games based on the novel, a dance, songs from the French musical, charades and a food tasting with authentic artisanal bread supplied by Dorothy Lane Market. Those students daring to speak English were jailed by Inspecteur Javert and his assistant, and were forced to write poetry in exchange for their liberation. Boosalis Bakery provided a French luncheon, complete with fresh baguettes and nineteenth century madeleine cakes and palmiers. Our 2016 Spanish Immersion Day was a great success! 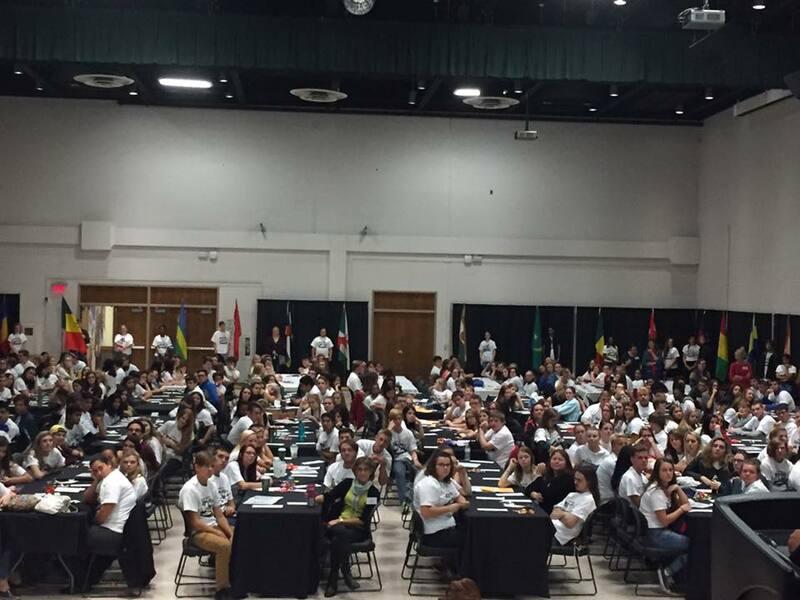 On November 8, 215 students and 14 teachers from 10 schools joined us to celebrate the diversity in the Caribbean. Interactive sessions led by faculty and students focused on cultural etiquette, doing business in the Caribbean, Spanglish, trivia games, and learning to dance salsa and merengue. A special hands-on session led by the Spanish club involved learning about the humble Costa Rican coffee cart as a work of art and cultural patrimony, and Dining Services delighted us with a Puerto-Rican-themed lunch. 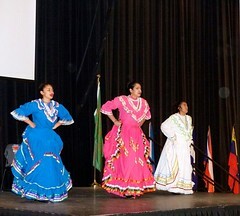 The dance performance by the local folkloric dance troupe Orgullo Mexicano, led by our own Spanish major Betsy Frías, was a big success, as was a fantastic Latino break dance performed by another major, Joe Pokorski. 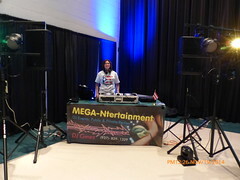 Everybody enjoyed the raffle and the traditional end-of-the day dance courtesy of DJ Megan Gómez of MEGA-Ntertainment. 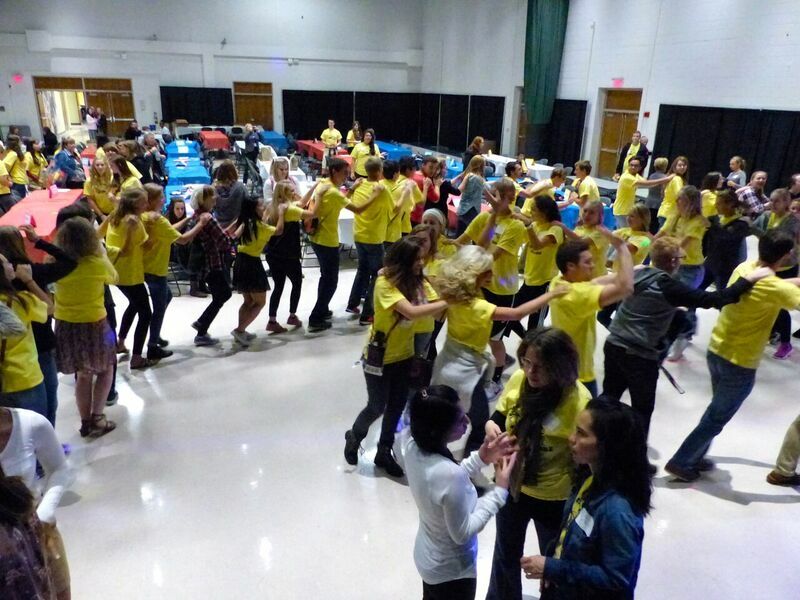 On Wednesday, November 19, 2014 in the WSU Student Union our annual Spanish Immersion Day was celebrated with a record number of attendees - 307 high school students of Spanish III and IV! This year the theme was El Descubrimiento de Puerto Rico (November 19, 1493). 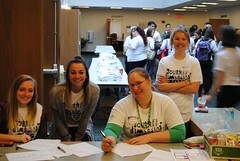 Our attendees and their dedicated language teachers came from fourteen schools from all over the state of Ohio. The following high schools were represented: Alder, Anna Local, Badin, Buckeye Central, Carroll, Cedar Cliff, Cedarville, Circleville, Edgewood,Fairmont, Gahanna Lincoln, Hilliard Darby, London, and Saint Peter's. 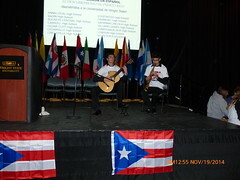 After being welcomed to campus by President Hopkins, Dean Sobolik, ML Chair Dr. Hertzler and Mr. Ortiz, Assistant Vice President of Latin Affairs, the students participated in several break out sessions led by WSU faculty and students to learn about a variety of topics related to Puerto Rico such as: government, language, music, tourism, puertorriqueños famosos, the indigenous taínos, and dance. Students had signed an agreement to only speak español, but those who were caught speaking in English had to serve some time in jail answering questions en español about grammar, geography, and vocabulary in order to be released. The student were treated to an authentic Puerto Rican lunch that included: arroz con pollo (rice with chicken) o arroz con gandules (pigeon peas with rice), plátanos maduros (plantains), and mantecaditos (shortbread cookies with jelly) while listening to live music. 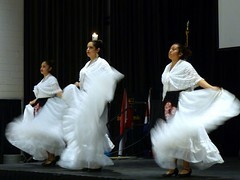 The event ended with a fiesta of music and dance. Wright State Spanish Immersion Day was held on Wednesday, November 13, 2013 at the WSU Student Union from 9:00 am – 2:00 pm. 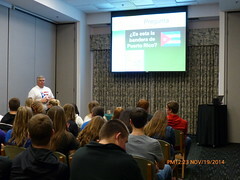 There were 241 third and fourth-year Spanish students from eleven different Ohio high schools: Bexley, Buckey Central, Edgewood, Jonathan-Alder, Monroe, Ripley Union Lewis Huntington, Rittman, Tippecanoe, Waynesville, West Liberty-Salem, and Worthington Christian. 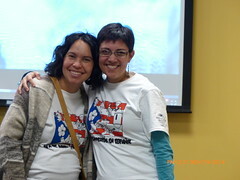 The theme was Viajar por el mundo hispanohablante. 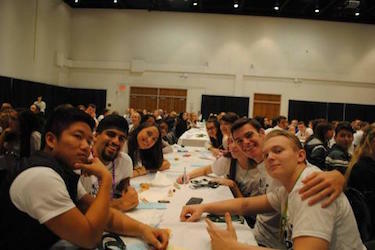 On their journey, students travelled to: Argentina, Ecuador, España, México, Perú and Puerto Rico. 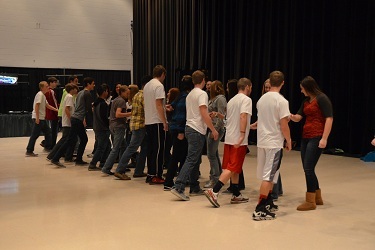 They had the opportunity to dance and to learn about various musical instruments from Spain and Latin America. WSU Spanish majors and minors, the WSU Spanish Club, and Spanish faculty members lead cultural activities in the target language for all of the high school Spanish students. Any student, who was not speaking Spanish, had to go to jail. In order to be “bailed out”, the students had to answer correctly three questions related to culture, grammar, and vocabulary. The students were treated to an authentic Cuban sandwich from Boosalis Bakery and during lunch they were entertained by two WSU students who performed various songs in Spanish. After lunch, DJ Megan Gómez, a WSU alumna, provided music for the participants to dance bachata, merengue, reggaeton, and salsa. The Department of Modern Languages hosted the fifth Chinese Immersion Day on Feb. 15, 2018 in the Student Union Apollo Room. Chinese Instructor, Haili Du , organized the immersion experience for 85 high and middle school students with at least one year of Chinese language instruction. Together, we celebrated the Year of the Dog and helped students deepen their knowledge of the Chinese language and culture. 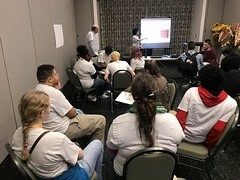 The students and their teachers represented four schools: Dayton Regional STEM School; Fairmont High School; Forest Hills School District and the Miami Valley School. 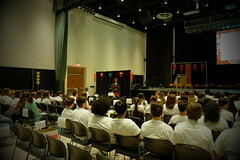 Dr. Marie Hertzler, Chair of the Department of Modern Languages, welcomed the students. 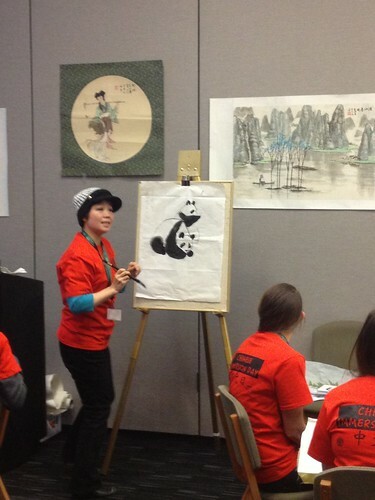 She encouraged the students to dive into the adventure for the next three hours as a speaker of Chinese Mandarin. Following the Chair’s remarks, Modern Language Chinese minor senior student Mr. Alexander Gilles talked to the audience in Chinese about his own experience learning the language at Wright State University as well as at Shaanxi Normal University for the study abroad program. He pointed out learning Chinese was not easy, but it will help them better understand its rich history, cultures and arts. With the knowledge of Chinese language, great opportunities and bright futures were ahead of them. 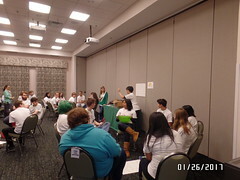 After pledging to speak only Chinese throughout the day, the students participated in four breakout sessions. In the Peking Opera Mask painting session, students learned to use brushes to put different colors to make a Chinese traditional Opera mask. Peking Operas are listed as the masterpieces of human intangible cultural heritage. 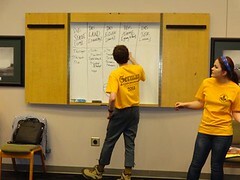 During the Charades session, students competed within small groups to guess a Chinese phrase. The winners of each small group then competed against the other groups using complicated phrases or sentences. All of the students were very quick at recognizing the characters and actions the words represented. In the Chinese Culture Jeopardy room, the students were not only challenged with all the Chinese cultural knowledges, but also competed with speed and listening comprehension. This year the students got the opportunity to learn Fan Dance with Chinese typical Kong Fu music; students learned the Kong Fu postures with a red folding fan in one hand. 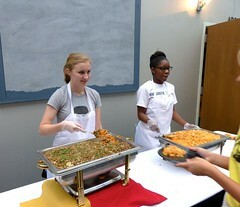 Lunch was provided by our own school Chartwells service. The meal included prosperity dumplings, longevity noodles, with chicken or tofu. Immediately after the Chinese Immersion Day, over 200 local students and visitors came to the Apollo Room to celebrate the Lunar New Year hosted by the Latino, Asian, and Native American Center. 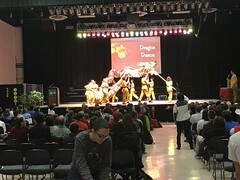 The students from the Dayton Regional STEM School and Miami Valley School gave enthusiastic Dragan dance and martial art performances on the stage. 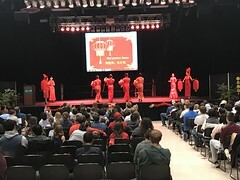 Everyone truly enjoyed the Chinese Qipao costume performance by Dayton American Chinese team. Visitors had a great time visiting different cultural booths. The sixth annual Chinese Immersion Day will take place on Tuesday February 5, 2019. The Department of Modern Languages hosted the fourth Chinese Immersion Day on January 26, 2017 in the Student Union Apollo Room. Chinese Instructors, Haili Du and Maan Broadstock, organized the immersion experience for around 110 high and middle school students with at least one year of Chinese language instruction. Together, we celebrated the Year of the Rooster and helped students deepen their knowledge of the Chinese language and culture. 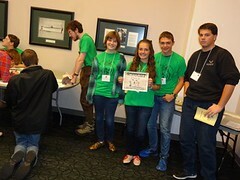 The students and their teachers represented five schools: Bishop Ready HS; Dayton Regional STEM School; Miami Valley Middle School; Piqua HS and Springfield HS. Dr. Marie Hertzler, Chair of the Department of Modern Languages, welcomed the students with the authentic greeting phrase in Chinese: “Chi le ma?”(Have you eaten breakfast?) instead of the standard Good morning! The students were surprised but happily responded. She mentioned the support of the Dean of the College of Liberal Arts who knows the importance of learning languages. 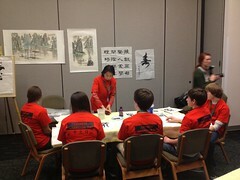 She encouraged the students to dive into the adventure for the next three hours as a speaker of Chinese Mandarin. Following the Chair’s remarks, Modern Language alumna and 2014 Chinese minor outstanding senior Miss Ashley Binns talked to the audience in Chinese about her own experience learning the language at Wright State University. She pointed out that learning Chinese was not easy, but assured the students that great opportunities and bright futures were ahead of them. 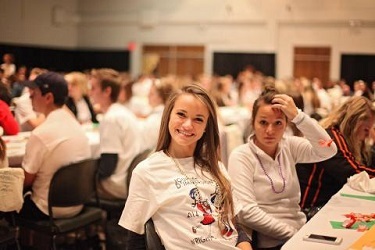 Ashley is going to take an English teaching position in a university in Beijing this spring. 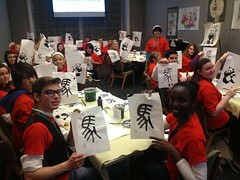 After pledging to only speak Chinese throughout the day, the students participated in four breakout sessions. In the Chinese Knotting session, students learned to make a Chinese traditional decorative knot with colorful silky thread for holidays and special occasions. This handcraft making can be traced back over 1,000 years ago. At the Building Sentence session, students performed activities including recognizing characters by adding different radicles to different words to come up with new characters. Students also used the characters to make additional phrases which expanded to complete sentences. 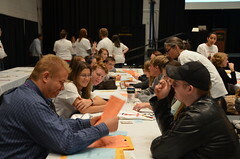 In the Catching Phrases session, students played a game taking turns picking up cards with a character or a phrase on it. The student with the card made his/her teammates guess the word or phrase on the card using verbal clues or body movements. This year the students got the opportunity to learn a dance – Ice Age Dance with Chinese lyrics and light, cheerful music led by Chinese instructor Lily Chen from Dayton Regional STEM School and Lee Huntsberger, student worker from Department of Modern Language. Lunch was provided by Tsao’s Cuisine Fairborn, a local Chinese restaurant. The meal included prosperity dumplings, longevity noodles, with chicken or tofu. 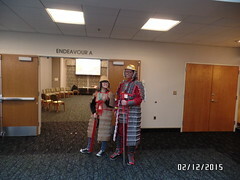 Immediately after the Chinese Immersion Day, over 400 local students and visitors came to the Apollo Room to celebrate the Lunar New Year hosted by the Asian/Native American Center (ANA). 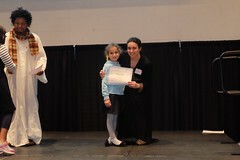 The students from the Dayton Regional STEM School and Miami Valley School gave enthusiastic dances and martial art performances on the stage. Everyone truly enjoyed the magnificent Chinese magician performance by Ms. Ying Li and Face Changing performance by Mr. Chengdu Li and had a great time visiting different cultural booths. The fifth annual Chinese Immersion Day will take place on Thursday, February 15, 2018. The Department of Modern Languages hosted its third annual Chinese Immersion Day on February 8th, 2016 in the Student Union Apollo Room. 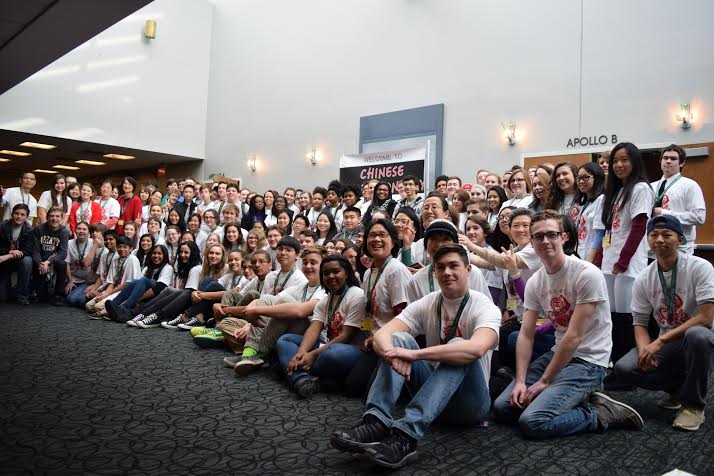 Chinese instructors Haili Du and Maan Broadstock organized the immersion experience for 120 high school and middle school students with one or more years of Chinese language instruction. The event celebrated the Year of the Monkey and helped students deepen their knowledge of the Chinese language and culture. 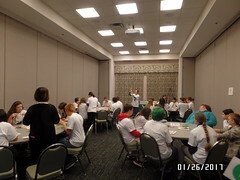 The students and their teachers represented six schools: Dayton Regional STEM School; Piqua HS; Miami Valley Middle School; Bishop Ready HS from Columbus; and Seven Hills School and Cincinnati Hills Christian Academy School from Cincinnati. Dr. Kristin Sobolik, Dean of College of Liberal Arts, and Dr. Marie Hertzler, Chair of the Department of Modern Languages, welcomed the students, commended them on becoming bilingual citizens of the 21st century, and encouraged them to continue language study. 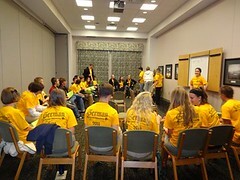 After pledging to speak only Chinese throughout the day, the students participated in breakout sessions. In the calligraphy session, students practiced Chinese brush painting and drew a Zen Monkey – the Chinese zodiac symbol of 2016. At the “Making Sentences” session, students enthusiastically created sentences with given phrases and competed to show their knowledge of Chinese sentence structures, character recognition and reading them correctly. 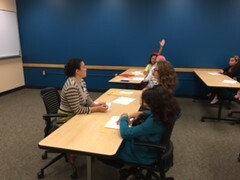 In the “Let’s Talk” session, students played three language games to practice their verbal communication skills. 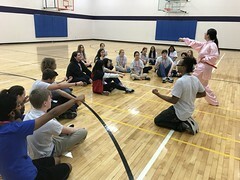 This year the students got the opportunity to learn a few moves of Chinese Martial Arts led by Chinese instructor Ms. Gu from Miami Valley School. Lunch was provided by Timmy’s Wok, a local Chinese restaurant. The meal included prosperity dumplings, longevity noodles, and chicken or tofu. 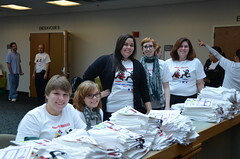 The Lunar New Year Celebration, hosted by the Asian/Hispanic/Native American Center, followed the breakout sessions. Students from the Dayton Regional STEM School and Miami Valley School gave enthusiastic dance and martial art performances on the stage. Everyone truly enjoyed the magnificent Chinese acrobat performance by Li Liu and had a great time visiting different cultural booths. 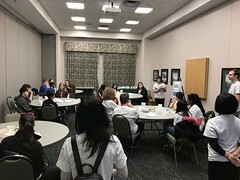 The Department of Modern Languages hosted its second Chinese Immersion Day on February 12, 2015 in the Student Union Apollo Room. Chinese instructors, Haili Du and Maan Broadstock, organized the immersion experience for 117 high school students with one year or more of Chinese language instruction and together, we celebrated the Year of the Goat and helped students to deepen their knowledge of the Chinese language and culture. The students and their teachers represented six schools: Dayton Regional STEM School, Northmont HS, Miami Valley School, Bishop Ready HS, Bellbrook HS and Cincinnati Hills Christian Academy. Dr. Marie Hertzler, Chair of the Department of Modern Languages, welcomed the students, commended them on becoming bilingual citizens of the 21st century and encouraged them to continue language study. 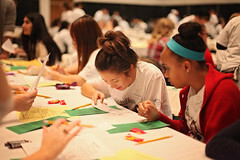 After pledging to speak only Chinese throughout the day, the students participated in breakout sessions. 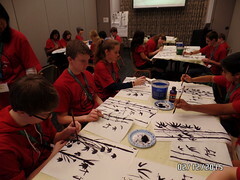 In the calligraphy session, students practiced painting bamboo–the symbol of spring. During the culture jeopardy session, students enthusiastically competed to show their knowledge of Chinese history and culture. The breakout session, “Character Challenge”, gave students practice with recognizing, pronouncing, and writing selected Chinese characters. For the “Let’s Communicate” game, students played a bingo game that involved the use of verbal communication skills. 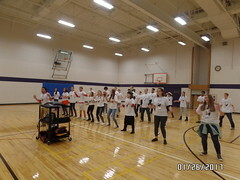 Tai Chi Fan Dance was a new addition to the breakout sessions where students learned a popular fan dance led by instructor Marsha Markert. Lunch was prepared by Chartwells Dining Services and included prosperity dumplings, longevity noodles, and chicken or tofu. 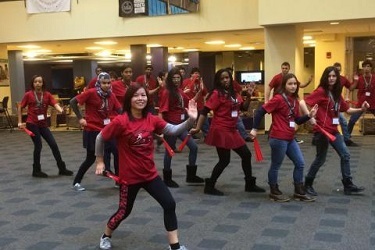 The Lunar New Year Celebration, hosted by the Asian/Hispanic/Native American Center, followed the breakout sessions. Students from the Dayton Regional STEM School and Miami Valley School gave enthusiastic dance and martial art performances on the stage. 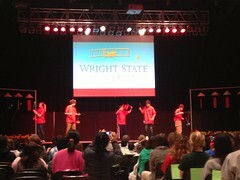 Everyone truly enjoyed the amazing Chinese acrobat performance and had a great time visiting different cultural booths. The Department of Modern Languages hosted its first Chinese Immersion Day, “认识中国 － Discover China”, on Jan. 30, 2014 in the Student Union Apollo Room. 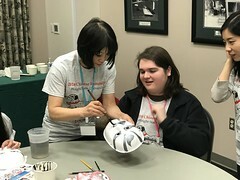 Instructors Haili Du and Maan Broadstock organized the immersion experience for 105 high school students with two years or more of Chinese language learning to celebrate the Year of the Horse and to deepen their knowledge of the Chinese language and culture. 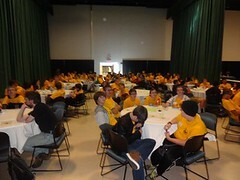 The students and their teachers represented seven schools: Bellbrook HS; Bishop Ready HS; Centerville HS; Dayton Regional STEM School; Miami Valley School; Northmont HS; and Oakwood HS. Dr. Kristin Sobolik, Dean of the College of Liberal Arts, and Dr. Marie Hertzler, Chair of the Department of Modern Languages, welcomed the students, commended them on becoming bilingual citizens of the 21st century, and encouraged them to continue language study. 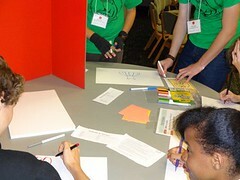 After pledging to only speak Chinese during the day, the students participated in breakout sessions. In "Chinese Calligraphy" they practiced the art of using ink and brush, which culminated in ink on paper horse character 馬 and beautiful pandas. In the "Chinese Culture Jeopardy" session, students enthusiastically competed to show their knowledge of Chinese history and culture. The "Chinese Character Challenge" gave students practice with recognizing, pronouncing and creating language with selected Chinese characters. In "Let’s Communicate" students practiced speaking and listening skills through the telephone game and competed on speed and accuracy. Students enjoyed authentic and traditional Chinese New Year lunch fare: prosperity dumplings, longevity noodles, rice and chicken or tofu prepared by WSU dining services, Chartwells. 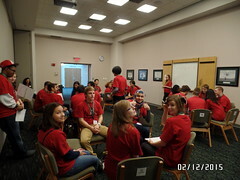 The New Lunar Year celebration, hosted by the Asian/Hispanic/Native American Center, immediately followed the breakout sessions. Students from Dayton Regional STEM School and Miami Valley School gave enthusiastic music and poetry performances on the stage. The Department of Modern Languages' second Chinese Immersion Day will take place Thursday, February 12, 2015. 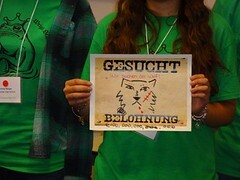 On October 28, 2015, the German section of the department of Modern Languages hosted its third German Immersion Day. 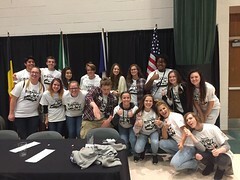 42 students visited Wright State University to enjoy a day of speaking German, compete in exciting games and enjoy delicious German food and wonderful prizes. Our special guests were the Volkstanzgruppe of the Liederkranz-Turner Verein, Dayton's very own German club founded 125 years ago. Under the tutelage of Ms. Lois Lynch, WSU German Club students, as well as dancers from Liederkranz-Turner in Springboro danced for and with us. 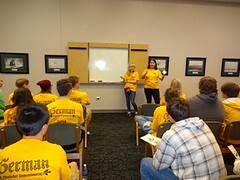 On October 29, 2014, Wright State University hosted its second German Immersion Day and welcomed 88 students from Beavercreek High School, Coldwater High School and Kettering Fairmont High School to a day filled with German games and food. 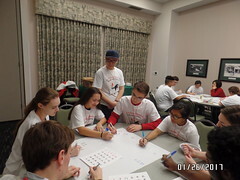 Decked out in T-Shirts designed by our Alumnus, Alvin Helms, the students split into three groups to play various games hosted by Dr. Dona, Frau Powers and Dr. Sturdevant. 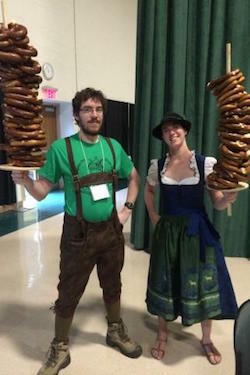 This year’s theme included all 6 German speaking countries in the European Union, Austria, Belgium, Germany, Liechtenstein, Luxemburg, and Switzerland. Lunch included Chicken Schnitzel, Spätzle, Apple Sauerkraut, Pretzelsticks and Applestrudel. Rewarded with German candies, book prizes, and many other gifts from Modern Languages, the Goethe Institute of Chicago and the German Embassy, the students enjoyed contemporary German music videos before their departure home. We are grateful to the teachers Frau Hecht, Frau Humphrey and Frau Yuker to share their students with us. 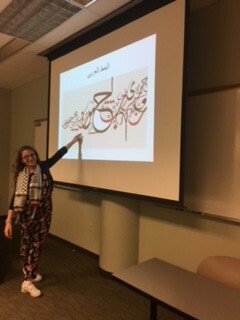 On October 7, 2016, Wright State University hosted its third Arabic Immersion Day and welcomed 16 students, parents, teachers and the principal from the Islamic Sunday School in Dayton to celebrate the Hijri New Year 1438 known as the Islamic New Year (Arabic: "Ra's al-Sanah al-Hijriya" ). The first Islamic year begins in 622 AD with the emigration of Prophet Muhammad from Mecca to Medina, known as Hijra. 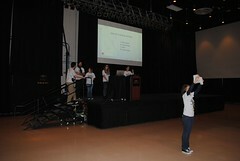 Students pledged to speak only Arabic throughout the activities. 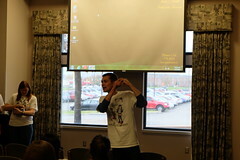 The students toured the Wright State University Library and enjoyed the storytelling "Prophet Muhammad before al-Hijra". 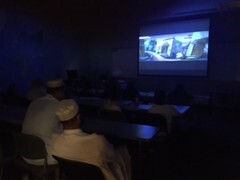 After the reading activity, students were engaged in other activities hosted by professor Orr and the Dayton Islamic School Arabic teacher, Arwa Saleh: Arabic Calligraphy, a movie " Al-Hijra of Muhammad" followed by a Quiz, and the "99 names of God" Quiz . Students also enjoyed learning and singing the Hijri New Year song " Tala'a-l badru 'alaynaa" as well as Henna. We are grateful for Dr. Marie Hertzler, chair of the department of Modern Languages who welcomed the students and encouraged them to continue their language and culture studies. 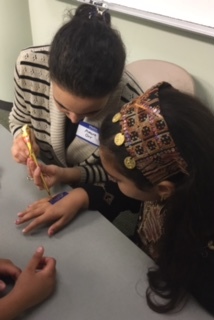 On October 12, 2015, Wright State University hosted its second Arabic Immersion Day and welcomed 60 students from Dayton Islamic School to celebrate the culture that unifies the different Arabic nations! 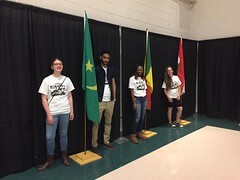 At the opening ceremony, students of Arabic performed a flag parade to welcome the students and celebrate their parents' country of origin ( Kuwait, Palestine, Morocco, Pakistan, India, Libya, United States of America, Kenya, Iraq, Syria, Jordan, Bangladesh, Saudi Arabia and Somalia), followed by a flag and country quiz. 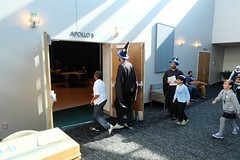 After celebrating their heritage with the flag parade, students pledged to speak only Arabic throughout the day. 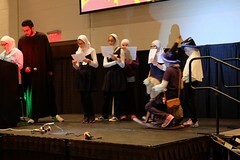 The students participated in fun activities hosted by professor Orr and professor Mabra: students learned the first simple steps to write in Arabic Calligraphy "الخط العربي”, they enjoyed acting in the comedy of " Juha and the Donkey" from the Arab and Persian folklore, an entertaining play containing morals and teaching wisdom. Lunch was prepared by Chartwells Dining Services and included Okra with halal lamb and yellow rice, spinach pie, Baba Ghanoush with pita bread and rice pudding for desert. We are grateful for Dr. Kimberly Barrett, Vice-President of the Multicultural Affairs and Community Engagement and Dr. Marie Hertzler, Chair of the Department of Modern Languages who both welcomed the students and encouraged them to continue language study.